Lyndon Johnson was the 36th President of the United States who served in office from November 22, 1963 to January 20, 1969. What was the life of Lyndon Johnson like? The short biography of President Lyndon Johnson covers important information and facts about his early life, his family, career and the famous events and achievements of his political life. 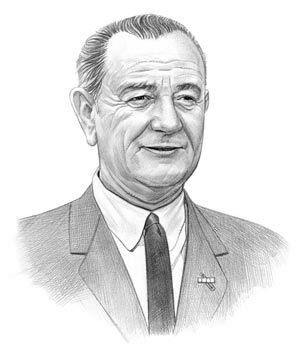 Our short biography of Lyndon Johnson provides an interesting and easy way to learn about the life of the President. The following important facts provide a fast overview of important facts about President Lyndon Johnson. Facts and Info: Lyndon B. Johnson was the 36th president of America who was sworn into office on an airplane after the assassination of John F Kennedy. His presidency was dominated by the Vietnam War although his policies resulting in significant anti-poverty measures and civil rights programs should also be remembered. For additional info refer to 20 Facts about Lyndon Johnson. Facts and Info: Lyndon B Johnson was born on August 27, 1908 near Stonewall, Texas. Lyndon Baines Johnson was named after W.C. Linden, a lawyer and family friend, Baines was his mother’s maiden name. He came from a family of ranchers and farmers. Lyndon B. Johnson died on January 22, 1973 in Johnson City, Texas. Facts and Info: The career of Lyndon B Johnson included the roles of Teacher, Politician and Statesman. He received an excellent education at Southwest Texas State Teachers College and Georgetown Law School. He became the 36th President of America in 1963 and served for 6 years until 1969. Facts and Info: Lyndon B Johnson married Claudia Taylor who was known as Lady Bird. When she was a small child her nurse described her as "purty as a ladybird," and this nickname replaced her actual first name for the rest of her life. Her family called her Lady but her husband always called her Bird They had 2 daughters named Lynda Bird and Luci Baines. Facts and Info: Lyndon B Johnson belonged to the Democrat Political Party. He was 55 years old when he was inaugurated as the 36th president. LBJ came to power when John F Kennedy was shot and killed in Dallas, Texas on November 22, 1963. Hubert Humphrey stood as Vice President. For additional facts refer to his Presidential Cabinet members. Short Biography of Lyndon Johnson: What he was like! Facts and Info: Lyndon B. Johnson was an imposing figure standing at 6 feet 3 inches tall inches tall and weighing approximately 210 lbs when he became president. He had blue eyes and black hair which turned grey as he grew older. He was often described as being raw and boisterous. He also had courage and received the Silver Star in a combat mission. LBJ was sworn in as President aboard Air Force One following the assassination of JFK. Facts and Info: During his presidency he played a key role in important events of the era. The Vietnam conflict was a prolonged war between the communist armies of North Vietnam who were supported by the Chinese and the armies of South Vietnam who were supported by the United States. The War had started in 1954 and opposition to the war escalated during his presidency. At home the Civil Rights Act was passed in 1964 and Medicare and Medicaid programs aided his "War on Poverty." On a somber note both Dr. Martin Luther King, Jr and Robert Kennedy were assassinated during his presidency. Facts and Info: During his life Lyndon B Johnson suffered from various health problems including angina, gall bladder disease, heart disease and multiple heart attacks. Facts and Info: Lyndon B Johnson died of heart failure on January 22, 1973 in Johnson City, Texas. His death came the day before a ceasefire was signed in Vietnam and almost a month after former president Harry S. Truman died. Johnson was regarded as a highly competent politician and was honored with a state funeral. He was buried at the LBJ Ranch. The short biography of Lyndon Johnson provides a fast overview of the key facts and events about his life and the accomplishments of his presidential term in office. The following Lyndon Johnson video enables you to sit back and listen to the history of his personal and political life - a useful educational resource for kids, children and schools learning about the life of President Lyndon Johnson.